Rewarding Times has teamed up with the awarding-winning Locks Restaurant, overlooking the canal in Dublin 8 to offer you a 3 course meal with a glass of wine each for only €80. This offer is available all evening Tuesdays and Wednesday nights, and Thursday bookings from 5.30pm-6.30pm. Offer is also available on Friday & Saturday lunchtimes with a full bottle of wine - 12.30pm - 2.30pm. 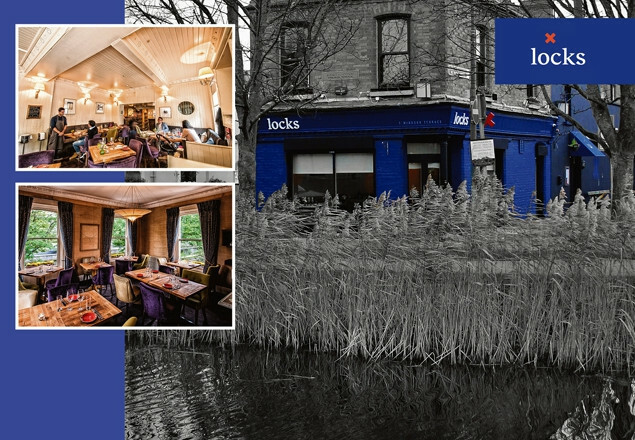 Locks is a neighbourhood restaurant with one of the most unique dining rooms in Dublin situated on the banks of the Grand canal, and was awarded 'Best Private Dining and Club Restaurant in Ireland' at the 2018 Restaurant awards. The restaurant is run by a passionate chef team of Connor O Dowd and Paul Mc Namara. General Manager Andressa Coutinho. Chef Chris Maguire. The set menu on offer is from Locks Restaurant's Market Menu. This menu changes regularly and is created each day by Locks Restaurant head chef Chris.